WordPress.com, the popular blogging service from Automattic, has some interesting growth statistics posted on its website. 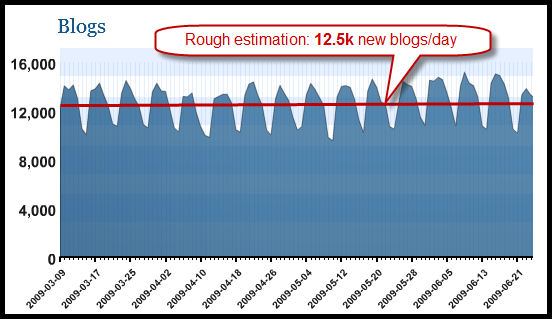 Among other things, there is a graph showing how many new blogs are created on the service each day. Based on the graphs that Automattic provides us with, it’s actually not that difficult to estimate how much WordPress.com will grow in 2009. Which, of course, was a temptation we couldn’t resist! 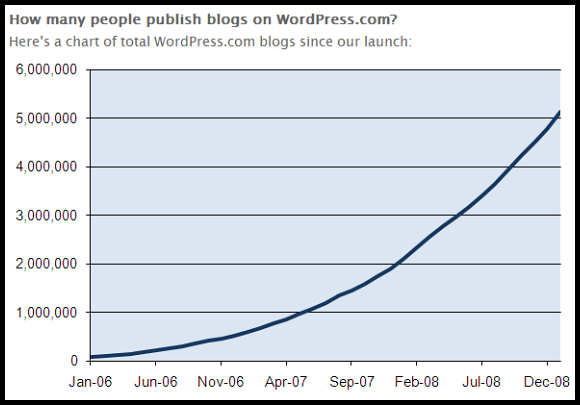 At the end of 2008, WordPress.com hosted a bit over 5 million blogs, according to this graph below (showing the growth from the start in 2006 through 2008). That the long-term growth for WordPress.com is trending up is also clearly visible in the graph above. It looks a bit like a very even exponential curve (i.e. it’s not just growing, but the growth rate is increasing as well). As the situation looks like now (see graph below), between 10,000 and 15,000 new blogs are added to WordPress.com each day, so let’s say that on average 12,500 blogs are added to WordPress.com on a daily basis. Now, some people will delete blogs as well, and Automattic has a graph for this data as well, revealing that there are on average about 1,000 blogs deleted per day. 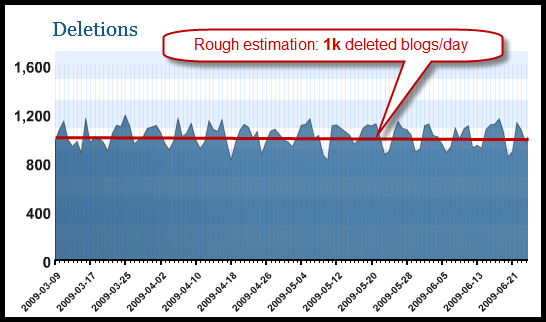 If we take these deletions into consideration, the WordPress.com blogging service is growing with an average of about 11,500 blogs per day. If WordPress.com hosted a bit over 5 million blogs at the start of 2009, and if we take the increasing growth rate into consideration, it looks quite likely that WordPress.com could pass 10 million hosted blogs by the end of 2009. The graphs are all from the WordPress.com stats page, but we added our own notes (in red) to the daily growth and deletions graphs (which is pretty obvious). Device posts your heart rate to Twitter. Downtime = you’re dead?